1939-40 Rear Axle Bumper set. 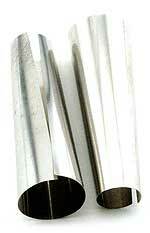 These are the quality axle bumpers, with the rubber bonded to metal, that fits under frame rail just above axle. Set of 2. The rubber has the Ford script moulded into it. 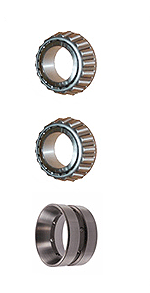 Complete pinion bearing set, consisting of double race and two bearings. Fits 1935-48 American Ford V8 car and pickup. Also 1948-52 Ford V8 Pilot. Universal Joint gasket set for the 1932-48 Ford V8. Repair kit for the rear universal joint. 1949-58 American Ford V8 car. Repair kit for the front universal joint. 1949-68 American Ford V8 car. 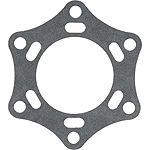 Torque tube gasket for the 1935 - 1948 Ford V8. Torque tube gasket for the 1932-34 Ford V8. 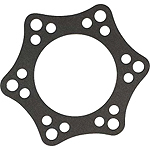 1932-48 Rear Axle Gasket Set Includes - 003, 005, 007, 009, Banso Housing, Gasket, U-Joint, Torq Tube, Speedo Gasket. Driveshaft Coupler Pin for 10 spline coupler. (Note: Must be cut down to use on the 6 spline coupler). Complete set of 20 original style thick headed bolts that bolt the axle shaft housings to the differential housing. Cad plated. Made in USA. 3.54 To 1 Ratio - 6 Splined. Please note that the 10 spline version is not available.